This Best of Las Vegas Brazilian Steakhouse is featuring a "Rodizio" Thanksgiving Lunch and Dinner served from 11am till 9pm. All Traditional Thanksgiving Dishes like Whole Turkey with Gravy Sauce, Candy yams and much more! Lunch includes 12 Meats AYCE plus a Turkey All-You-Can Eat with 4 Side Dishes as well as Gourmet Salad Bar with 35 Hot and Cold traditional Thanksgiving dishes for only $38.99. Dinner includes 20 Meats AYCE plus a Turkey Carved Tableside as well as 4 side dishes and Gourmet Salad Bar with 35 Hot and Cold traditional Thanksgiving Dishes for only $46.99. This Las Vegas Brazilian Churrascaria is located at 1225 S. Fort Apache Road Las Vegas NV 89117. Open seven days a week for Dinner and Sunday Brunch from 10:00am – 2:00pm. 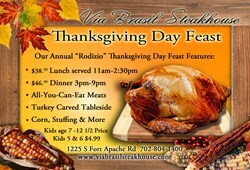 For reservations or more information, please call 702-804-1400 or visit http://www.viabrasilsteakhouse.com. Also please follow us on Facebook and Twitter @viabrasilsteakh.